My cohorts and I are forging these relationships that are amazing, and it’s really helped me to elevate my practice as a social worker and my teammates’ practice as a social worker. So it’s been uplifting, it’s been validating, and it’s also upping our game. Social workers play a key role in improving the individual experience of care, improving the health of populations, and reducing the costs of care for populations. Yet in many health care settings, social work services are undervalued and at times, understaffed. So, my name’s Bill Mitchell. I’m the director of palliative care at UC San Diego. And on the recommendation of one of our social workers, the first social worker on our team, we have asked each additional social worker joining our team to take the post MSW social worker course. Also, it was an I think a way to get all of our new social workers speaking the same language and on the same page. That as we hire folks from around town and from around the country with different backgrounds, experiences, coming from different organizations. There was a little flavor, different flair approach person to person end. Not that we want — not that we want clones, but we want people to understand each other, to be able to cover for each other, to pick up where another one left off with a patient as they transition from hospital to a clinic or whatnot. And to be documenting in a similar way so that this care becomes seamless and — And so, the post MSW gave you all of that? But you’ve seen the results on your team? My team comes back reporting. That has been very helpful. And we have a group of five social workers that are very cohesive happy working together and to create work. Our team wouldn’t be whole without them. And the course has been helpful to pull them together and help them function at it top of their license. So beautiful. So, summarize for me if you would. What do you think the top two or three benefits of doing that post MSW program for a social worker would be? Well, so I’m answering that question as an outsider. Yeah. A common vocabulary, added knowledge, information and skills as they relate to patients are probably the top two items that I have seen come out of the course. And what do you think just in general, what’s the future of palliative care with all the changes going on in healthcare right now, how does palliative care fit in? We’re going to be busy. We have a lot of work to do. There’s a lot of unmet need. We probably ever won’t reach all of that need. There’s so much out there and so every incremental step we can take, every increase, every added expert to the work force is vital. My name is Anne Front, I have a BSW, a Master’s in Clinical Psychology, and I’m a licensed marriage family therapist. I wanted to be in this course because I wanted to get more information, thoroughly understand the role and the purpose of the palliative care social worker. When I took the course, my kids were young, school-aged kids. A lot of homework, a lot of distractions. And, I thought, “How am I going to ever do this?” Eight months is a long time. By the end of the course, I was saying, “Why is it only eight months? I wish it was longer. I wish I could, you know, stay connected.” Which, I have stayed connected with people, with the organization. Every month, there was specific assignments and topics that we worked on, all relevant to the field, in terms of cross-cultural issues, ethical issues, clinical ways of working with patients and families, the ins and outs of symptom management, and the role of social workers in that process. So, I’ve had many years in the field with different populations, but when I started palliative care, I felt like I was a beginner, and honestly, this course was, I was looking forward to it. It ended up being a game-changer for me. I felt like it was a career-changer. It helped me understand the different ethical issues, clinical issues involved in working with palliative care. It also tapped into my inner strength, and the skills that I already have, to be the best clinician I can be. So, you know, I just totally enjoyed this course. It went too fast for me. I loved it. I learned so much. It’s such a valuable experience. It’s worth any sacrifice that you have to make. You will not regret it. I hope you take the course. 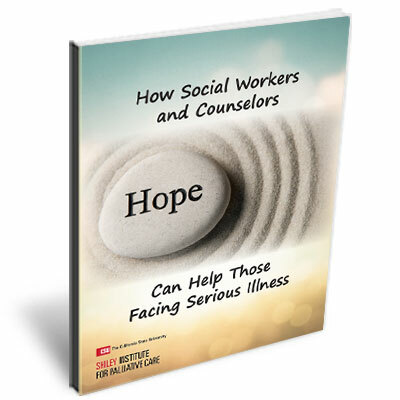 The role of the social worker is central to palliative care’s goal of providing compassionate, patient and family-centered care that relieves the suffering and improves quality of life for those with serious or chronic illness. Hello, my name is Sandra Shadley, and I had the distinct privilege of participating in the post-MSW certificate program, and I strongly encourage anyone who has any interest in exploring this program to do so. I can’t really say enough about the value of the course. It’s worth the time, it’s worth the energy, it’s worth the money. The strong support provided by not only the course instructors, but also the other students from around the country and around the world, was remarkable. There was a strong emphasis on leadership, and our ability to claim leadership within our systems wherever we work. And, I always had a sense of some projects and some opportunities I might have available there, secretly thought I could do some things that the course really helped me see that I could do, such a developing an education program, communication skills education program for medical residents, which was my final project, and is now in operation. So, it’s a very, very deeply enriching program in that way, and I think is building the future for social work and palliative care. So, please do consider this program, as not only a wonderful professional experience, but also a deeply enriching personal experience. The CSU Institute for Palliative Care’s Post-MSW Palliative Care Social Work Certificate Program is an online course designed to provide master’s prepared social workers with the knowledge and skills to be successful working in a palliative care, interprofessional environment whether that is in a hospital, hospice or other setting. Another Reason why You Should Consider This Powerful Course! I’m passionate about people not having pain, people not having to suffer, people being able to choose what they want, and what they don’t want. I want to be an advocate for that. Children aren’t treated like young adults in a hospital setting. There’s pediatric nurses and doctors. Palliative care, working with the seriously ill, is also a unique and specialized field. What the field is looking for right now is people that are trained, people that can train others in palliative care. There’s a lot of choices in education, and I chose the Cal State University Institute for Palliative Care. It just fits in nicely to my lifestyle, as far as being able to be home, take the courses online. I’m driven. I want to know, I want to learn more, especially about the field that I love. As social workers become leaders in the field of palliative care, having that education, that certificate, is important. What I love about being a social worker is being able to meet with families and patients, just being there at really important times in patient and families’ lives. In palliative care, I think it’s important to remember that our focus is really on living. Being able to offer someone relief from their symptoms, relief from pain, allows people to better interact with their family, to better interact with their friends. So, me seeing someone that’s been suffering from pain, get appropriate care, get appropriate treatment, I just, it’s wonderful. All classes follow a three weeks on, one week off format. Participants will be expected to spend between 6 to 8 hours weekly on course related activities during the three “on” weeks. Week 3: The Role of the Social Worker in Pain Management and Spiritual Care – We Are Right There With You! Week 3: Utilizing Clinical Techniques within Our Scope of Practice – CBT, Mindfulness, etc. Sandy Jones McClintic, LCSW, ACHP-SW is the Social Work Section Chair for the National Council of Hospice and Palliative Care Professionals (NCHPP) of the National Hospice and Palliative Care Organization (NHPCO) and a social worker with Hospice of Arizona. Chris Onderdonk, LCSW is a Clinical Social Worker with the Doris A. Howell Service at the University of California San Diego. He has over 10 years of experience in hospice and palliative care working across the continuum in hospice, bereavement, and inpatient palliative care. Chris has extensive experience training and mentoring social workers in the palliative care field and he has presented at both local and national conferences.